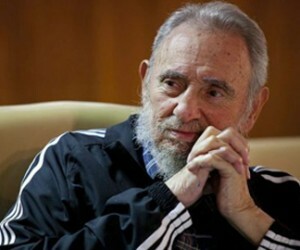 We should tell our brothers in Latin America and the world that the Cuban people will win, asserted the historic leader of the Revolution, Fidel Castro, in a special address at the closing ceremony of the 7th Congress of the Cuban Communist Party, in session for four days at Havana’s Convention Center. “I congratulate you all and firstly comrade Raul Castro for his wonderful effort,” pointed out Fidel, whose presence in the plenary session aroused prolonged applause from the nearly one thousand delegates and 280 guests present. Why did I become a socialist? More clearly, why did I become a Communist?, he asked, and explained how he acquired his ideology, without a private tutor to help him in the study of Marxism-Leninism, and stressed that another 70 years should not elapse for an event like the Russian revolution to occur, for humanity to have another example of a great social revolution that represented a huge step in the fight against colonialism and its inseparable companion, imperialism. However, he warned that the greatest danger now hovering over Earth derives from the destructive power of modern weaponry, because it could undermine peace in the world and make it impossible for human life on the surface of the earth to exist. Future generations will know -he reflected- much more than us, but first they will have to solve a big problem: how to feed the billions of human beings whose realities collide against the limits of the natural resources they need. “Let’s hope many humans worry about these realities and don’t continue like in the times of Adam and Eve, eating forbidden apples,” he commented, and expressed his concern about who will feed people without technology, or rain, or reservoirs or underground deposits. We must constantly insist on these issues, he stressed.